Some of you may be saying, "finally! a picture!". 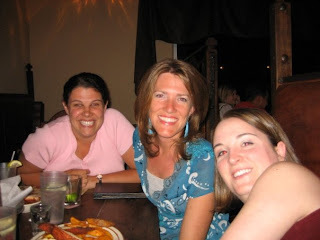 Yes, my friend Kate Sutton, our youth pastors wife, remembered her camera for our "girls night out" this Monday and I'm so glad she did! I always forget! A bunch of us "girls" got together to say goodbye to Kate and just for fun. Kate and her husband Terrance are leaving us and moving back to Chicago. So our church is looking for another youth pastor. I have been very blessed to get involved with a youth ministry team of fun people. 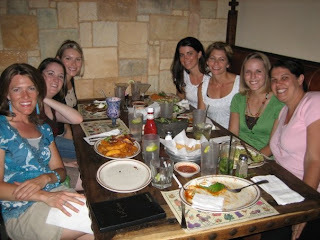 We meet after group every Wednesday and this was our first girls night. Thanks for checking in! I'll be in CT as of Memorial Day, and then our family is going down to Virgina. I'll be seeing some of you soon! I went to Idylwild, CA this last week from Monday thru Thursday and I failed to take any pictures! So I didn't have anything fun and new to show you. 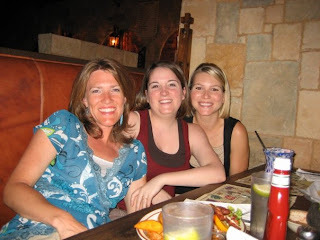 It was a Southwest Recruiters retreat. We meet twice a year and this was my very first time! I was excited and encouraged as I heard stories from the other recruiters around me. We heard from each region, worked on some new reports done on our personality profiles, and heard from our recruitment director as well. Our days were full and our nights spent online! How funny that email has so taken control of our lives! We all gathered in the same room, but instead of gathering in chatty groups, we all sat facing our computer screens. The very last night we were all able to peel ourselves away from those screens and play a fun game of "Apples to Apples". What a fun silly game! This weekend I got to go to the CA beach for the first time! I went with my neighbor to Oceanside! So California. It was so nice, and warm too! yeah! Sunday I was so blessed to be surrounded by friends. Sunday morning after church we talked for at least 30 minutes and in the evening we were all gathered in a friends home to send off our youth pastor and his wife. I am so grateful to begin to have a group of friends, and girlfriends! I leave next Sunday to go home to CT for a bit and then our family is all heading off to VA for a family vacation. As some of you know, my brother and his wife will be moving their belongings and preparing to leave the country for overseas service. We are getting in some good family time. At the end of that time, June 7 will be the memorial service for my grandfather, John L Pitts III. It is still hard to believe he is gone, and I think that that service is going to be particularly difficult for all of us. It will be held in Scottsville, VA our family "seat". I'd appreciate your prayers for us as we grieve all over again.